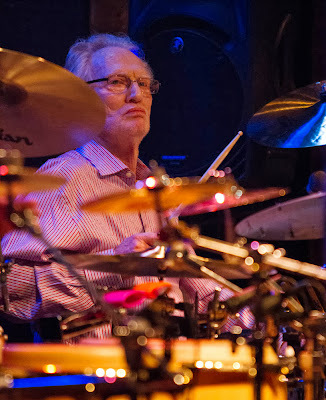 The title of last night’s encore, “Why?” is a good question to ask about Ginger Baker. 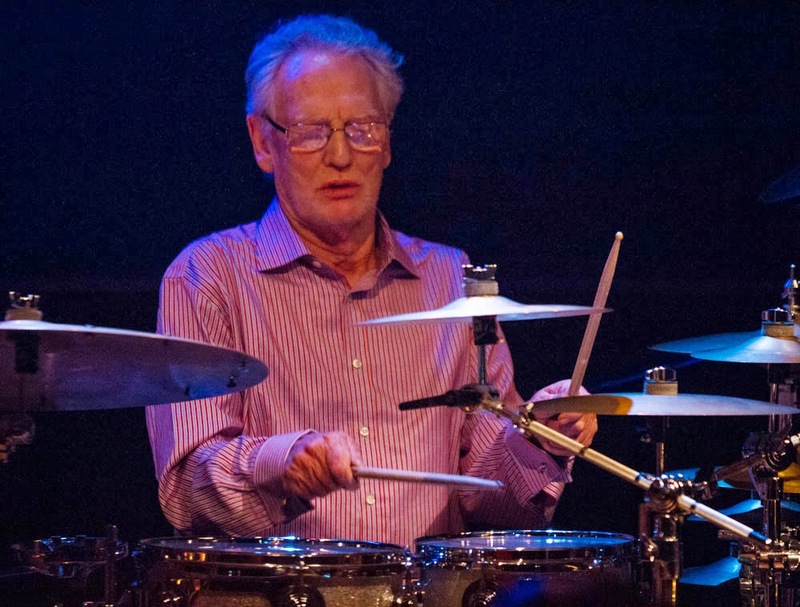 Why, at 74 and in poor health, is the former Cream and Blind Faith drummer, Rock and Roll Hall of Famer, cantankerous subject of the 2012 documentary “Beware of Mr. Baker,” hellraiser (his word, and the title of his autobiography), and one of the worst interviews ever, on the road again? In part, because he needs the money. He recently told Rolling Stone that was one of the reasons he was touring (“You have to earn money to live, don't you?”); he told the British newspaper The Mirror that a woman he hired in Africa as his personal accountant had stolen from him. He took her to court and won, but he lost his polo ranch in South Africa and all of his horses. Baker now lives in England again, with his fourth wife and stepdaughter. And because he enjoys the music. 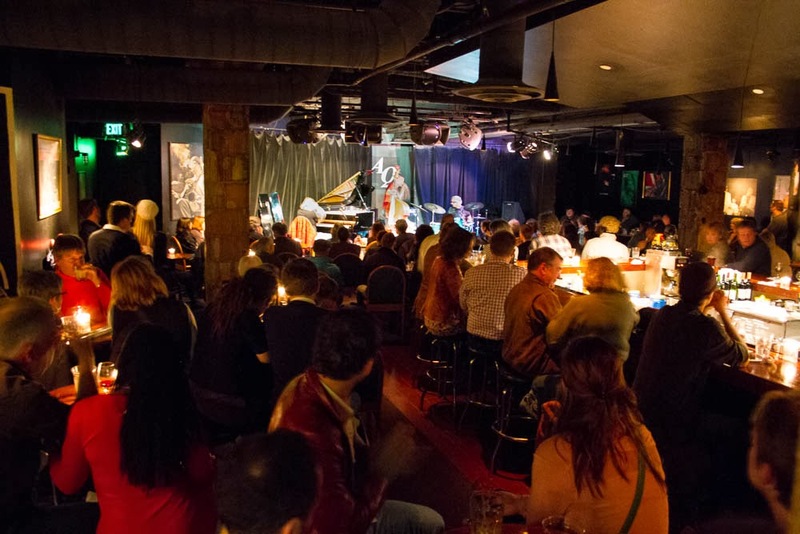 Why jazz, of all things? Baker has always loved jazz. He started out as a jazz drummer in the 1960s and brought its colors and complexities along when he moved into rock and superstardom. 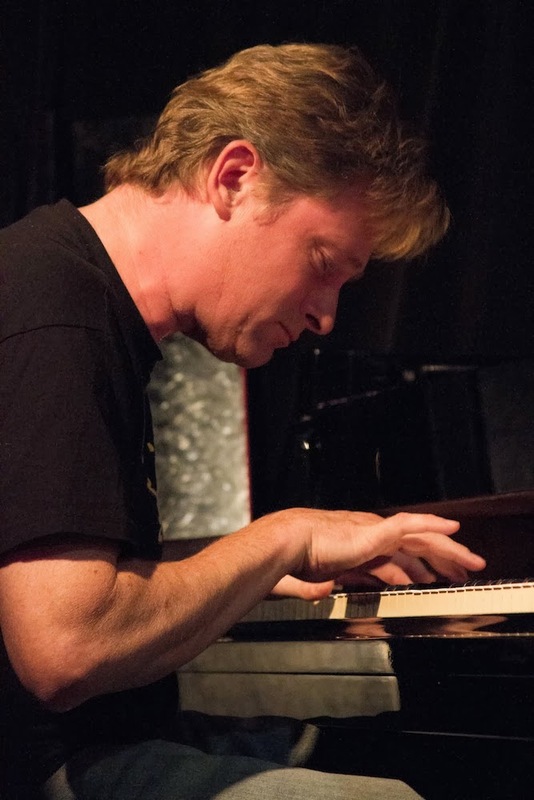 In the 1990s, he formed the Ginger Baker Trio with Bill Frisell and Charlie Haden and later created a group called the Denver Jazz Quintet-to-Octet (DJQ2O) with trumpeter Ron Miles and bassist Artie Moore. 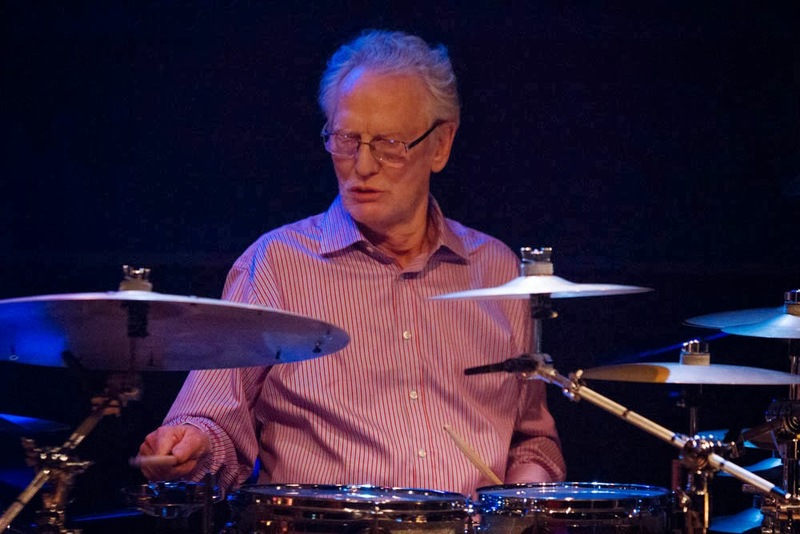 He played with Elvin Jones, Max Roach, and Art Blakey. 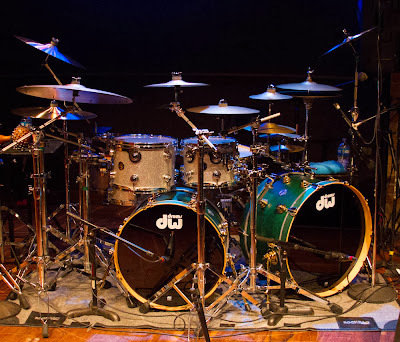 His double-bass-drum kit is a direct descendant of Louis Belleson’s. So Baker is not just another former rock (or pop, or country) star who decides to make a comeback through jazz. He’s been a jazz musician all along. In fact, don’t call him a rock drummer. He prefers jazz drummer. Baker named his latest group Ginger Baker’s Jazz Confusion, and it’s a real jazz band, with roots in America, England, and Africa. 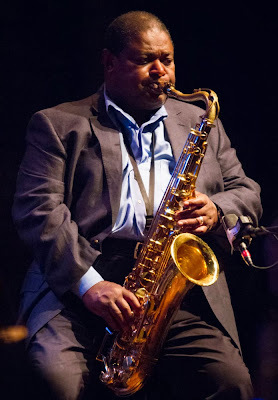 Schooled by Sonny Rollins, tenor saxophonist Pee Wee Ellis played with James Brown, Maceo Parker, and Van Morrison. 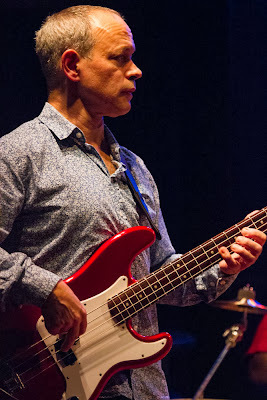 Bassist Alec Dankworth is the son of the great British jazz vocalist Cleo Laine and jazz saxophonist/bandleader John Dankworth. 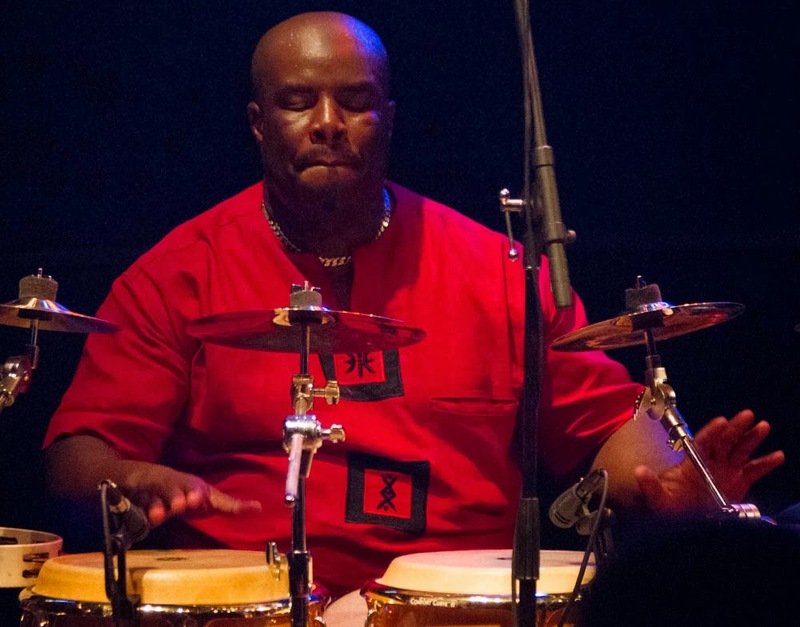 Ghanaian percussionist Abbas Dodoo has worked with Baker for many years; Baker affectionately introduced the big man as “my bodyguard.” He played congas, cowbell, and shekere (beaded gourd). Anyone in the audience at the Dakota who was hoping for some “White Room” or “Sunshine of Your Love” was put straight by the first song of the night, Wayne Shorter’s “Footprints,” a jazz classic newly infused with African polyrhythms. The rest of the set brought blues and world music and more jazz. How was the show? It was good. Very good, and often thrilling. Heavy on the drums, but that’s what everyone came to hear. 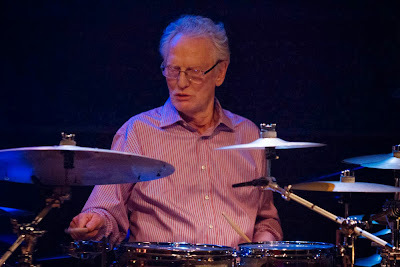 The legendary, terrifying Ginger Baker, live! Especially when Baker and Dodoo fell into a groove, it was all about the drums, pounding and interweaving those intricate rhythms in among the thunder of Baker’s two basses. Ellis eschewed the funk for which he’s famous and stuck to straight-ahead jazz, making sounds that probably surprised some of his fans in the house: sustained notes, like singing. It was direct and serious and down to business. In some ways, it was more like a rock concert than many jazz performances; players took solos, but they were short, with no out-there improvisations that can make those unfamiliar with jazz squirm in their chairs. 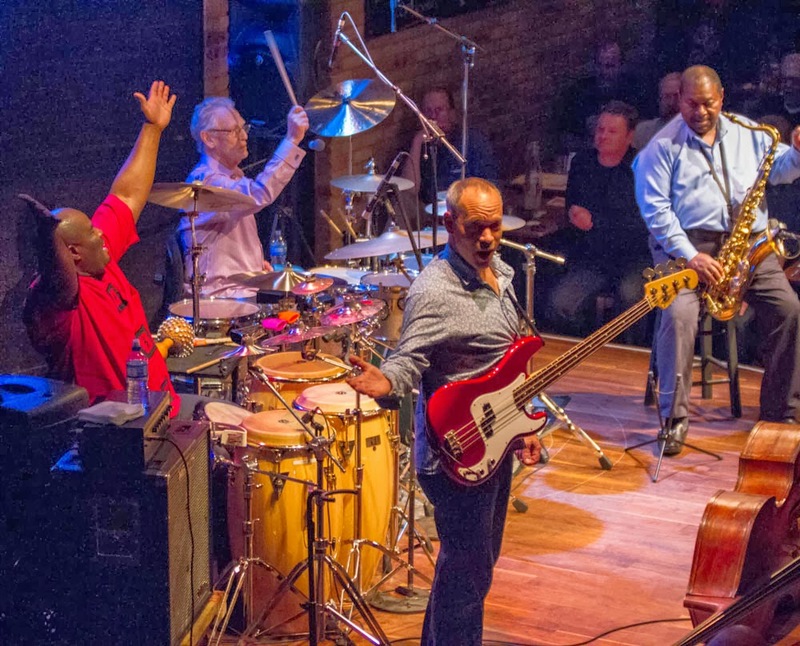 Last night won’t go down in history as the most transcendant or revelatory jazz concert ever, but it was one that a broad cross-section of music lovers – jazz fans, rock fans, ’60s survivors and hipsters – could appreciate and enjoy. Touring is not easy for Baker. 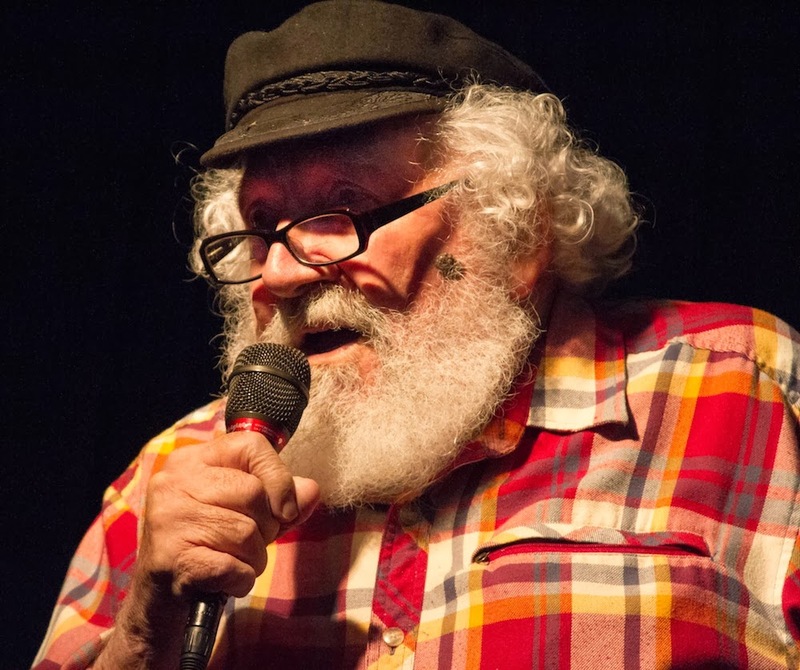 He has COPD (chronic obstructive pulmonary disease), caused by smoking, and he still smokes; he says it helps him deal with the pain of another serious medical condition that plagues him, degenerative osteoarthritis of the spine. 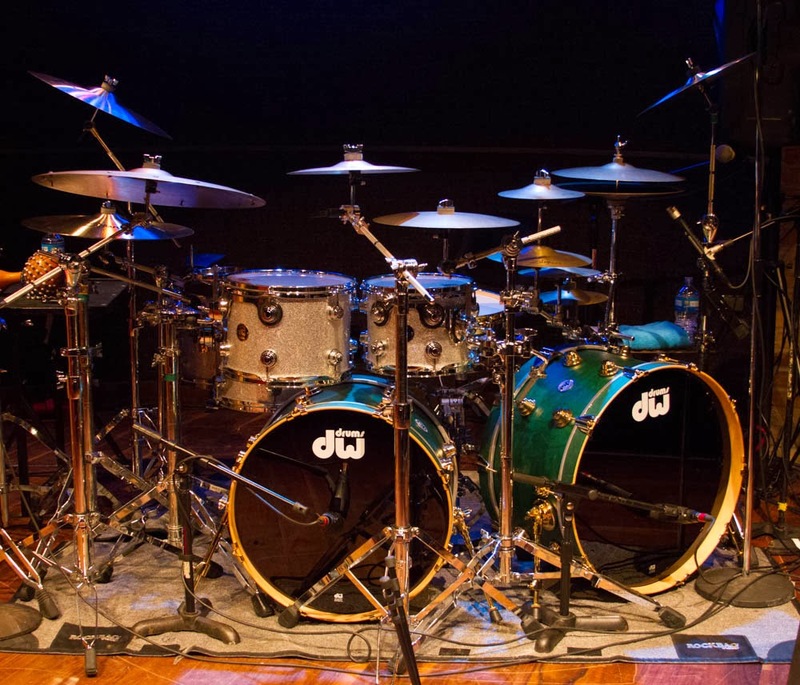 He told The Mirror that “drumming is agony.” He doesn’t launch into five- or ten-minute solos anymore, but neither does he hold back, even when it hurts, and from what he says, it always hurts. It was Dodoo who urged us to call him back for the encore. “Make some noise!” he shouted. “Say Gin-gah Ba-kah! Gin-gah Ba-kah!” We did. When the band returned, Baker introduced the encore with, “Terrible things have happened to me in the past, and they keep happening right up until today. And always, when these things happen, I ask a question: Why?” And we sang along: Why? Why? Why? 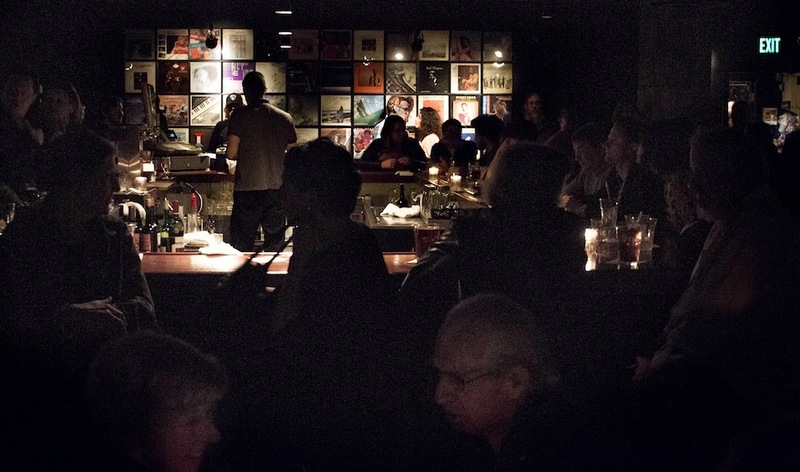 Now that the word is out that the Artists’ Quarter, the storied St. Paul basement jazz club, will close its doors on January 1, people are coming to see it before it’s gone. Last night, the joint was jumping. Some were there out of curiosity, others because the recent press about the closing was the first time they’d heard of the AQ, since it has never been big on advertising. But many were there to hear the weekend’s headliner, the great pianist Bill Carrothers. He’s one of several artists who live elsewhere but play semi-regularly at the AQ (we learned last night he’ll probably return in November) and nowhere else in the Twin Cities. 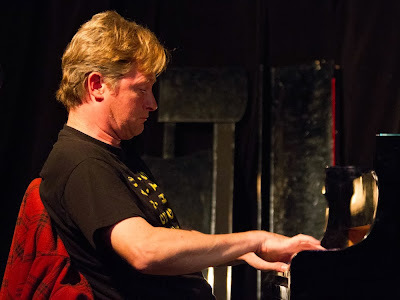 And then Carrothers played a passionate, virtuosic, joyous, emotional program of tunes he picked out of the air, some of which took brief detours into other tunes he picked out of the air. If you were sitting close enough, you could see him, before each song, put his hands over the keys, bow his head, lean in, and think … what next? You could see his fingers try out ideas in the air, his hands move slightly from key to key, chord to chord. Then he’d look up at Billy Peterson, say a word or two, and Peterson would turn quickly to Kenny Horst and repeat whatever Carrothers had said, and they’d be off. Carrothers can play anything, and does – dense block chords and airy arpeggios, cries and whispers, complex rhythms and simple 4/4s. His imagination is boundless and his dynamics are exquisite. He must have seen and experienced real beauty in his life, because he communicates it without reservation. 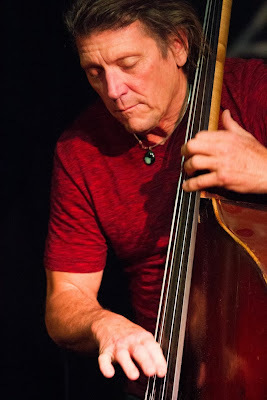 He’s playful, but privately, with the other musicians on stage and not so much with the audience; he never tells jokes or stories and seldom lets you know what he just played or is about to play, which explains my spotty set list. Most jazz musicians know a lot of songs, but Carrothers’ enormous mental library, the one he wanders through and draws from during every live performance, includes material not found in many jazz musicians’ books; since Carrothers is a history buff; you might hear melodies or phrases from World War I tunes or Stephen Foster. His lead-ins are thoughtful and evasive. You never know where he’s going until he gets there. He takes as long as he wants, improvising his way in, composing on the fly, until suddenly you’re hearing “Let’s Misbehave,” but you’ve come in through a side door you thought led somewhere else. When artists from out of town perform at the AQ, they usually play with area musicians, sometimes for the first time. 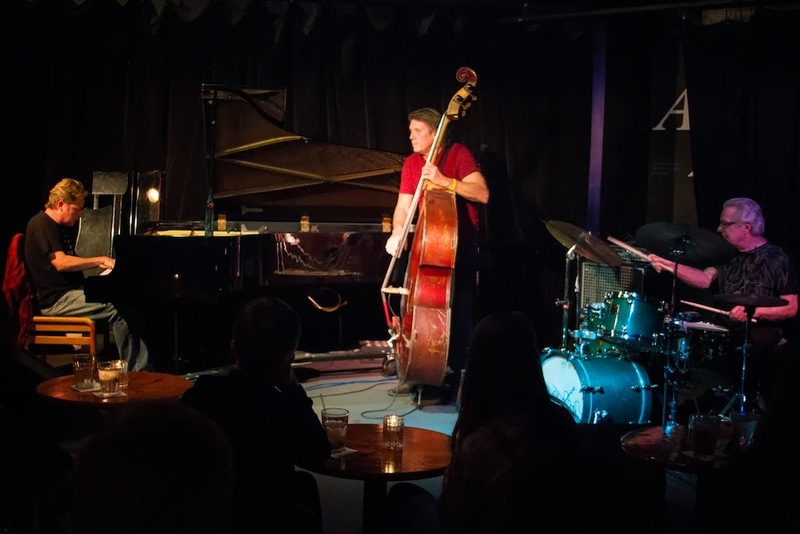 That happens in jazz all the time and offers its own brand of thrills; since improvisation is central to jazz, you never know how strangers will get along. Will they play well together? Will they listen to each other, complement each other? Will the music take off? 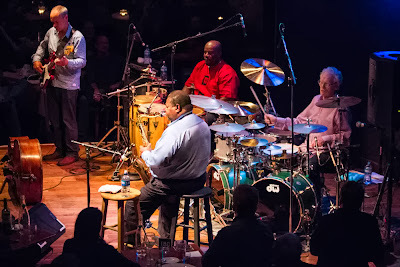 Although Carrothers makes his home in Michigan’s Upper Peninsula, this weekend was not the first time he played with Peterson and Horst. 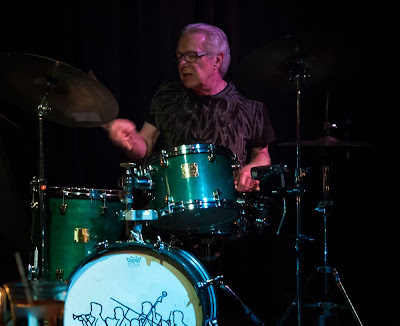 Horst, who has drummed with everyone over decades as a musician and club owner (the AQ is his place), put aside what’s on everybody’s mind – that the club’s days are numbered – and played like the pro he is. Are they numbered, or is the club's fate still unknown? Many AQ fans and supporters are not giving up. Anything can happen from now until January 1.